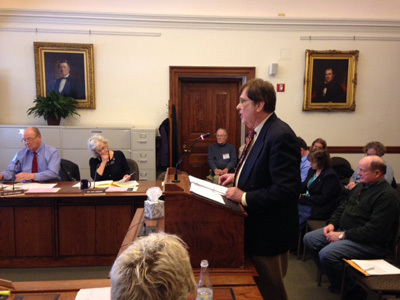 Recently I was invited to address the state legislature of Maine to discuss Agenda 21 and its assault on private property rights. THAT HAS NEVER HAPPENED BEFORE IN MY 20+ YEARS OF FIGHTING AGENDA 21. THIS WAS AN HISTORIC OCCASION IN OUR FREEDOM MOVEMENT! Our movement is gaining strength. I was given unlimited time to testify and was introduced as "the expert" on Agenda 21 and the protection of private property rights. I was invited because I have been working with local property rights activists, and with Maine State Representative Rick Long. I have been advising them that we need more than just a one of a kind anti-Agenda 21 bill – as has been tried in several states. You see, in many states, legislators have tried to create a "one-size-fits- all style of bill that calls for the banning Agenda 21. While I applaud that effort – the truth is – it doesn't work. That's because the pro-Agenda 21 forces LIE – and they say "their" plan is not Agenda 21 – but just a local plan. That one lie makes such Anti-Agenda 21 legislation worthless. So I am working to teach well meaning, concerned legislators that they must, instead, create a full legislative plan with a series of bills to stop the Sustainable Development juggernaut. We need to focus on stopping the attacks on private property rights. We need to stop the creation of non-elected regional councils and multi-county regional governments. And we need to stop these non-elected councils from applying and shackling our communities under federal grants that come with Agenda 21 policies requirements attached. Representative Long listened to my advice. He is now working to create an extensive legislative plan that will include several bills to protect private property rights, stop the taking of federal grants, and limit the power of the self-proclaimed big government "Stakeholders" which are driving the Agenda 21 policies in the back rooms of local and state government. First, let me address the 1,000 pound Gorilla in the room – the claim that Agenda 21 is just a right wing conspiracy theory. The Southern Poverty Law Centers says, "Agenda 21 is not a treaty. It has no force of law, no enforcement mechanisms, no penalties, and no significant funding. It is not even a top-down recommendation, seeking instead to encourage communities around the world to come up with their own solutions to overpopulation, pollution, poverty and resource depletion. It is a feel good guide that cannot force anyone, anywhere to do anything at all." And that is exactly what planners, non-governmental organizations and federal officials tell you and city councilmen and county commissioners every day. The fact is, up until the mid 2000s, no one was saying Agenda 21 was a Rightwing fringe fantasy. In 1992, over 50,000 delegates, including diplomats, business leaders, government officials, members of thousands of non-governmental organizations and 179 heads of state – all gathered in Rio de Janeiro to introduce to the world a document they called a "Comprehensive Blue Print" for reorganizing human society. Obviously they thought it was a pretty big deal. Then, later that same year, Nancy Pelosi introduced the idea to the US Congress through a Resolution calling for Congressional support of Agenda 21. She called it a Comprehensive Blueprint. (I've got the Cspan video on my website). The UN, in a 1993 publication described Agenda 21 like this: "Agenda 21 proposes an array of actions which are intended to be implemented by EVERY person on Earth...it calls for specific changes in the activities of ALL people... Effective execution of Agenda 21 will REQUIRE a profound reorientation of ALL humans, unlike anything the world has ever experienced." In 1994, the American Planning Association (one of the largest and respecting planning groups in the nation) put out a newsletter calling Agenda 21 a Comprehensive Blueprint. In that one paragraph, this document brings together the APA, Agenda 21, the UN's Earth Summit, Al Gore, Sustainable Development, the President's Council on Sustainable Development, NGO groups with the mission of implementing Agenda 21 and the description of Agenda 21 as a "comprehensive Blueprint" for Sustainable planning. In 1997 the United States issued a 70 page report to the United Nations Department for Policy Coordination and Sustainable Development. That report, entitled "Implementation of Agenda 21: Review of Progress made since the UN Conference on Environment and Development, 1992" documented the progress the US was making to implement Agenda 21. In 1998, the Federal Register issued a report on the EPA's Challenge Grant Program. That report says, "The EPA's Challenge Grant Program is also implementation of Agenda 21." In 2011, the EPA issued a revised report entitled "History of Sustainability." It details how EPA policy on Sustainability was developed. The Fifth item on that report is Agenda 21, calling it a "comprehensive process of planning and action to attain sustainability." And on and on it went, about Agenda 21. The blueprint. The plan. The consensus. The direction for changing how people live. Here was the plan for the 21st Century! And they were quite proud of it. In fact, it wasn't until the mid 2000s that such pride started to change to denial of any knowledge of Agenda 21 and charges of conspiracy theories. That's when I and others started to reveal the truth about Agenda 21 and sound the alarm bells. And a few years later, thousands of concerned Americans started to ask questions. Suddenly, the Sustainable Development movement became hard pressed to remember anything like that. Never heard of it, went the cry. In fact, the entire green movement, officials in government, planning groups, and NGOs went suddenly dumb. Their most often used description of Agenda 21 is an "innocuous, 20 year old document that has no enforcement power." Just like the SPLC said in its report against me. Continuously we hear that local planning programs, especially from such groups like the American Planning Association (APA) have no connection to Agenda 21 or the UN. It's all local – or as the APA says in its document, "Glossary for the Public, "There is no hidden agenda." So, let's talk about why this is such a controversy and why I and thousands of others are trying to stop it. First, It is true that it Agenda 21is not a treaty. It is true that the plan in itself has no enforcement capability. And it is true that there are no Blue helmeted troops at city hall. Agenda 21 is not a law. So, how did Agenda 21/Sustainable policy make its way into every state, and nearly every community in the nation? After those 50,000 world leaders, Non-governmental organizations, government bureaucrats, and 179 heads of state signed agreement to Agenda 21 at the Earth Summit in 1992, the policy then gained huge momentum when, in 1993, President Bill Clinton, issued Executive Order 12852 to create the President's Council on Sustainable Development and made it official US policy. Then, those same NGOs who wrote Agenda 21 at the international level, converged on our government and helped to write the federal policies. Most importantly they helped to create grant programs. The grants, through HUD, the EPA and nearly every other agency in the Federal Government are the kool aid used to spread the policy across the nation. They tell you the grants are voluntary, and in a sense they are. But they come with very specific strings attached that are, in fact, Agenda 21/Sustainable policy. A few examples include restrictions on energy use, development, building codes, land use controls, and water controls. The rules impose international guidelines for building materials, plumbing codes, electric codes; installing bike lanes; building apartment buildings with no parking lots, and establishment of public transportation, including light rail trains. If a local government "voluntarily" takes the grant they automatically are forced to accept the restrictions. In short, they must implement the guidelines of Agenda 21. After creating such "voluntary" programs, the same NGOs headed to the state legislatures and lobbied for legislation that forced every community to impose comprehensive development plans. Then, as the local communities were faced with the task of writing such plans, the same NGOs appeared at the door of county commissioners and city councils – conveniently armed with plans and "grants" to help them write and pay for their development programs. In the back rooms of city halls and the state legislatures, government officials work hand in hand to write policy with the very NGOs which created Agenda 21. These groups wield power only because elected officials give it to them. That is the secret they are hiding under all the pretty words about livable communities and smart growth. But, why do we consider it a threat? To understand the true threat of Agenda 21, you must first understand that it is NOT an environmental policy or just a good idea for planning future development for communities. Agenda 21 is a threat to our nation, to our states, and to our local communities – because it is, in their words, a comprehensive blueprint specifically designed to change our way of life and our form of government. That's its purpose. That's why they call it an "agenda!" Agenda 21 comes to us in three parts. Economic. Equity. Environment. We call it the three Es. And they encompass every aspect of our lives. The Economic section means Public Private Partnerships between government and selected private corporations. Through these partnerships the government gains the ability to hide behind the independence of business. Those private corporations spend their advertising dollars to convince us to accept the policies. They become the government's free propaganda tool. Business gets the power of government, such as the use of Eminent Domain and special tax credits. In fact, now spreading through legislatures across the nation is a policy called Benefit Corporations. Benefit corporations create a new class of corporations that have accepted Sustainable policy as their own. Once they take that step, these private companies essentially get to go to the head of the line for government programs, protections, and hand outs. It's a new business model that shifts the economic focus away from profits for shareholders in order to fulfill social and environmental missions. The business gets ahead by essentially becoming a sustainable monopoly protected by the government. That brings us to the second E. Social Equity or Social Justice. If you fail to understand this aspect of Agenda 21, then you will have no understanding of the issue. Social Equity is simply redistribution of wealth and is at the root of literally every sustainable policy. And the third E is Environment. It is nothing more than the excuse to get us to blindly accept sustainable policy, basically under the use of fear. Everything in human society today, we are warned, damages the environment. And so society has gone into a kind of paralysis, afraid to move forward. So how does all of this affect Americans? How does it change our way of life? And how does it change our system of government? There are many policies, plans and tools designed to implement Agenda 21/Sustainble Development. You hear the terms everyday as you go through your legislative duties. Wetlands, conservation easements, water sheds, view sheds, rails – to- trails, biosphere reserves, greenways, carbon footprints, partnerships, preservation, stakeholders, land use, environmental protection, development, diversity, visioning, open space, heritage areas, Smart Growth, and comprehensive planning are all part of the new language of government. Each one of these items, and many more, lead to controls, outright banning, shortages, higher costs, bigger government, and sacrifice of the American people. Let me take just one of these as an example to illustrate how it works. Perhaps the largest and farthest reaching plan is – Smart Growth. We're told Smart Growth policy is necessary to create the community of the future to guarantee effective planning to protect the environment by reducing our carbon foot print for global warming. In fact, almost every state, and every region of each state has a similar plan in process, usually ending with numbers like 20/50. They are all the same basic plans, no matter where they are in the nation. One thing they all have in common – none of them are LOCAL! That's by design, because most are being implemented by the same planners nationwide, fueled by the same grant programs, and aided by the same NGO private groups. Smart growth planners promote their schemes by insisting that Americans live the wrong way. And they use land use regulations to impose on others what they insist is the right way to live. In Omaha, Nebraska, government and NGO forces are working hard to sell the community on a grand plan for the future called Heartland 2050. Of course, as usual, it's not just for Omaha – but for eight full counties in the surrounding area, all combined into the same regional plan run by an unelected regional council. And the plan openly says it is Sustainable Development. Listen to the sales pitch. The Goal of Heartland 2050, according to its promoters, is to develop a strategic "vision" for the region's development over the next 30 years to assure "proper growth?" "The Metro area is always changing," say proponents, "but is it moving in the right direction?" Stop right there! You must ask – in the right direction according to whom? This massive plan will lay the ground rules for transportation, housing, jobs, property/land use, education, and even health care. It means they intend to put a line around the communities involved and declare little or no growth outside that line. That means the focus for future housing will be for high density neighborhoods with residents living in high rise housing. Walkable communities, they call it. It means, the use of private cars will be discouraged in favor of public transportation, bicycles or walking. How is that done? Several ways. Higher taxes on cars and on gasoline – and there are now plans being developed in various states to tax every mile you drive. Heartland 2050 includes the program called the "Complete Street." That is an edict that cars must share the road with bicycles. It calls for "Traffic Calming," which means large speed bumps placed in the center of residential streets that make it very unpleasant to drive over. Across the nation, through smart growth plans communities are now building residential apartment buildings without parking lots. It's all designed to discourage your interest in driving so that you use bikes for short trips and public transportation, including light rail trains. So, how does all of this effect us? Will life in the community improve? Well, the best evidence I can give you to predict the future is to look where all of this has already been tried. Over a decade ago, Portland, Oregon was announced as the poster child for Smart Growth policy. There it was nearly fully implemented. You can take an airplane over Portland and actually see the smart growth line around the city. On one side is vast, dense development. On the other side is nothing but open land. Today, local planners assure the community that they want citizen input – that each will have a say in every aspect of the plan. Well, surveys show that over 85% of Americans want to live in single-family homes with a yard and a drive way. But smart growth planners ignore that fact. Instead, the plans call for major controls on suburban housing development out of concern for future population growth. Housing to provide for growing population density becomes the concern. You see, once the ban on suburban development (urban sprawl, the call it disdainfully) is in place, there is now a controlled living area. It doesn't grow. What happens when the population of the community does grow? It gets crowded. More densely populated. In Portland, the planners kept upping the density requirements for housing. To increase urban densities, the planners turned dozens of neighborhoods of single-family homes into apartments and condos. If you owned a vacant lot, you could not build a single-family house on it – you would have to build a row house or apartment. In some cases, the restrictions were so strict that if your house burned down, you could not rebuild a single family home on the property. Eventually, Portland planners decided that row houses and low-rise apartments were not enough. They changed the rules to enforce the building of high rise apartment buildings. Pack and Stack, we call them. They call them livable, walkable communities. Fewer cars, fewer CO2 emissions, we are assured. Then they gave tax breaks, below-market land sales, and other subsidies to developers who built the high rises. That meant that traditional neighborhoods were invaded by high rise developments. The center of the plan was the light rail train system. The desirable homes (according to the planners) were those built along the rail line. This would assure convenience for ridership, they claimed. Whoops. Independent studies reveal that the people living in them don't ride public transit any more than residents in single family neighborhoods. In Atlanta, Georgia, the push was on to build a light rail transportation system. One resident studied the plan, took the official estimated construction cost and overlaid that with the number of predicted riders of the system and found that he could buy every single rider their own limo and even throw in a driver. The result of Portland's grand plan is that increased density has destroyed the community atmosphere. Congestion is worse, Housing and consumer costs are higher and urban services such as fire, police, and schools have declined as the city took money from these programs to subsidize high-density developers. Now for those of you worried about social equity and the needs of the poor and minorities, I'm here to tell you that Smart Growth policy is a very bad deal for the poor. The economics of Smart Growth are sobering and hit few harder than the poor. As growth boundaries limit space, new home construction drives up housing prices beyond the reach of most. Studies show that prior to the Smart Growth surge in the 1990s, an average home cost just 2.5 to 3 times the median income of community residents. So, a person earning $40,000 annually could likely purchase a home for $120,000. But in 2006, in Smart Growth cities like Boston, Portland and San Diego, homes respectively cost 6.5 and 10.5 times the median family income. Homes costing just 4 times or more annual incomes are considered "seriously unaffordable." Today, a family in San Diego earning $125,000 would be hard-pressed to afford a home 10 times that amount. These Smart Growth economic realities are now forcing low income and young people to rent and downsize. The poor have little hope of ever buying a home and experiencing what used to be called the American dream. And here is the kicker. In 2012, the American Planning Association, the main group in the nation pushing Smart Growth policy, conducted research to confirm that the policy was working. The last summary paragraph of that report is the most telling. It says: "The current planning policy strategies for land use and transportation have virtually no impact on the major long term increases in resource and energy consumption. They generally tend to increase costs and reduce economic competitiveness....In many cases, the socioeconomic consequences of less housing choice, crowding, and congestion may outweigh the very modest C02 reduction benefits." In short, the American Planning Association found that the very policy that it spreads across the nation DOES NOT WORK! But have they given up on it? Not on your life. Why, Money. The grants. The APA's life blood. Well, this is just a quick example of Agenda 21/Sustainable Development policies that have proven to be unworkable, and in fact actually destroying American culture and society. The question now is what do we do about it? Many states have tried to pass a one size fits all bill to ban Agenda 21 and protect private property rights. Experience is now showing us that doesn't really work. For one thing, the proponents of Agenda 21 no longer use that term. They just deny their ideas are part of it, claiming them to be local. Second, the Agenda is so vast, so all invasive of every aspect of our lives, that one bill can't possibly be effective in stopping it. So here are a few of my recommendations on how to develop an effective counter plan. First, understand that Agenda 21 is being implemented through three main points of attack. Attacks on private property rights. The fact is, Sustainable Development cannot be implemented without diminishing private property. Creation of non-elected Regional councils and governments. This is the fastest growing change in government today and is the reason I say Agenda 21 is changing our system of government. It is taking government farther from the voters. Federal grants with severe Sustainable strings attached are the poison that feeds the beast. One bill will not solve this situation. You need a legislative plan to attack these three threats through a series of legislative initiatives. Concerning the establishment of regional councils and governments, while governments certainly need to talk to each other, they must not be allowed to legislate. Perhaps there are elected officials on those boards, but they were not elected to that particular board. If they have plans that they think will benefit their communities, then they must be forced to come home to face their constituents in proposing these ideas. They must not be allowed to hide behind closed doors, ignoring possible opposition. And regional councils must not be allowed to apply for federal grants. That must be the job of elected bodies. In fact, one solution designed in the tiny community of Rindge, New Hampshire, makes it necessary that there be a vote of the people before the local government can apply for any new HUD grants. As for protection of private property rights, the most important element of legislation is to define your terms. Too many are trying to pass legislation that simply says we are going to protect property rights. What does that mean? Today, many don't even understand what property rights are, so you must be specific. "Property in a thing consists now merely in its ownership and possession, but in the unrestricted right of use, enjoyment, and disposal. Anything which destroys any of the elements of property, to that extent, destroys the property itself. The substantial value of property lies in its use. If the right of use be denied, the value of the property is annihilated and ownership is rendered a barren right." The Planners will swear support for protection of property rights while at the same time denying use. USE – that is the key word. Sustainable proponents will adamantly oppose this approach. They will attack the bill containing that language, saying you are opening the way for anarchy. They will dream up crazy scenarios to paint a picture of horror if homeowners are aloud to use their own property. Such as, someone might put a smelly pig farm next door to you. And they will say it drastically limits local governments from doing their job. Neither of these are true. First, the problem with planning is it tries to enforce a one-size-fits-all straight jacket that attempts to anticipate any possible problem. Government in a free society must stop trying to micro- manage people's lives and let them deal with each other until there is a real problem. Since human civilization began there have been ways for individual property owners to deal with specific problems – nuisance laws. And, in most cases, these can be handled in the courts between the two parties. It is quite possible that no problems will ever actually arise that the local government will need to handle. After all, that is how most communities grew for the better past of 200 years or more. But the rules and regulations of Sustainable Development aren't really about protecting one neighbor from another. Nor are they about creating livable communities. They are about control in a deliberate attempt to change human society to fit someone else's political agenda. Private property ownership is the reason the United States has been the richest, freest nation in the world. Isn't it significant to see that as private property comes under attack through Sustainable Development, that our country is also becoming less wealthy and less free! It's time that we had a government that treats property owners like OWNERS – not chattel to be pushed around at the planner's whim. It's time to treat property owners like adults. Finally, let me just leave you with this thought. As you search for ways to control the growth and power of government, consider this; with each new bill that is introduced into the legislature, give it the SCRAP test. Does this bill increase the Size, Cost, Reach And Power of Government? If so, SCRAP it. No matter how wonderful your plans may sound, make sure they first and foremost protect the private property rights of the owners. These are the most effective actions this body can take to stop Agenda 21 and reign in run away government.